Sylvie knows everything about her husband, Dan, and vice versa. They can predict each other's actions, finish one another's sentences and have shorthand conversations. A dream, right? Until one doctor's visit turns their ideal marriage into a long bad dream. The doctor predicts they are both healthy and have a long life ahead. Until death do you part means another seven decades. EEK! The glossy veneer begins to dull. 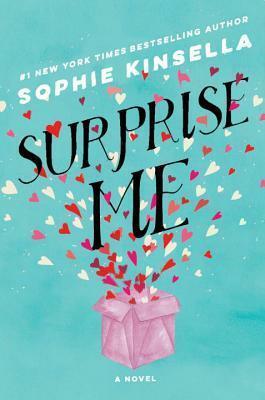 To keep the boringness out of their marriage, the couple concocts a plan: Project Surprise Me. Keep the marriage exciting by surprising each other with spontaneous dates and untold truths. This has to unfortunately be the first Sophie Kinsella novel that I did not fall in like with. 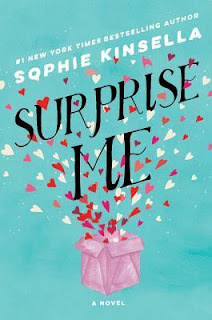 Surprise Me lacked the signature Kinsella charming wit and humor. It took almost the whole novel to gain interest in the main character and the superficial story line. For once, chick lit was annoying. Be happy you're living another 60+ years with the person you love; don't dread it! Usually I like light chick lit reads but this was a major eye-roll until the last chapters. Happy Early Pub Day, Sophie Kinsella! Surprise Me will be available Tuesday, February 13, 2018.